Looking through the thousands of structures in the PDB, we get the impression that proteins must have a stable, folded structure to be functional. Recently, however, it has become clear that many proteins use disorder when performing their jobs. For instance, the small apoptosis protein NOXA (shown here in red from PDB entry 3mqp, solved by PSI researchers at NESG) has a random structure when it is free in solution, and only adopts an ordered, alpha-helical structure when it binds to its partner in the cell. 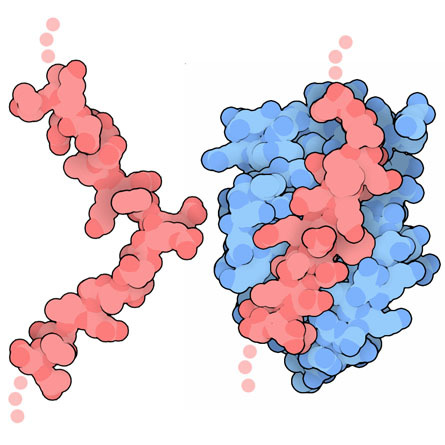 Other hints of the utility of disorder are scattered around the PDB, such as flexible hinges in antibodies and loops that open and close in HIV protease. Disorder is surprisingly common, once you start to look. Disordered regions have characteristic sequences, which can be predicted much like the more familiar sequences that cross through membranes. PSI researchers at NYCOMPS have applied these prediction methods to several genome sequences and uncovered some interesting trends. Disordered regions seem to be particularly common in signaling and regulatory proteins. Like NOXA, disordered chains allow lots of options for a protein to interact with many other proteins in a signaling network. Related to this, they found that disordered proteins are much more prevalent in eukaryotic cells than in bacteria, which is a reflection of the greater complexity of eukaryotic regulatory networks. Disorder is used in different ways to enhance the function of proteins. Many signaling proteins have flexible tails that bind in grooves on their signaling partners. Flexible loops are also widely used by proteins. For instance, the GlnK protein has a long, flexible loop that binds to its target, an ammonia channel, and blocks its function. The loops are easily seen in the crystallographic structure of the complex (shown here from PDB entry 2ns1, solved by PSI researchers at CSMP) but when the GlnK protein is crystallized by itself, the loops are disordered and not seen in the experiment (PDB entry 2gnk, not shown). The GlnK structures underscore one of the great challenges for studying proteins that use disorder in their function: it's difficult to solve the structure of a protein that's intrinsically unstructured. Crystallographers often need to clip off the disordered parts to promote crystallization. NMR spectroscopy, on the other hand, can be used to look at proteins with appreciable disorder. 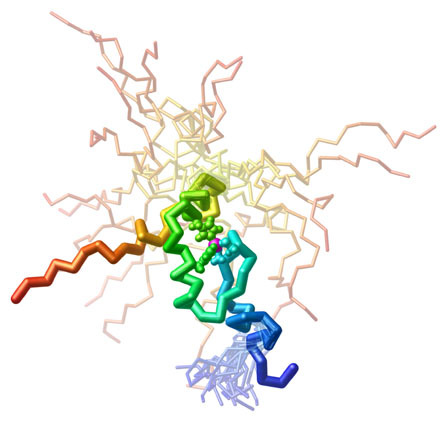 For instance, PSI researchers at CESG have used NMR to study ZNF593, a transcriptional regulator with 115 amino acids, and found that it has a folded zinc finger at the center and long disordered tails at either end (PDB entry 1zr9). Presumably these tails play a role in the interaction with other transcription factors. To take a closer look at disorder in this structure, the JSmol tab below displays an interactive JSmol. Twenty models of ZNF593 are included in this NMR structure analysis. Use the button to play an animation that steps through all the structures, and notice that the zinc finger is relatively stable, but the flanking chains are highly mobile. Schlessinger, A., Schaefer, C., Vicedo, E., Schmidberger, M., Punta, M. & Rost, B. 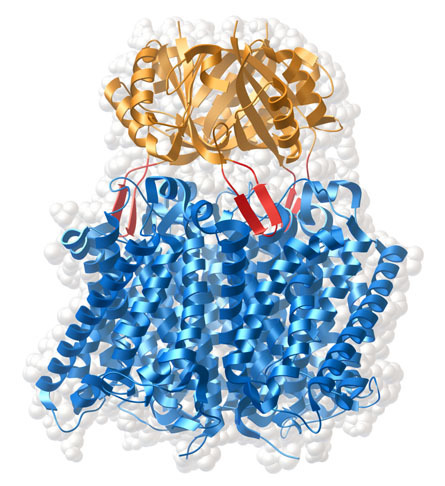 Protein disorder -- a breakthrough invention of evolution? Curr. Op. Struct. Biol. 21, 412- 418 (2011). Hayes, P. L., Lytle, B. L., Volkman, B. F. & Peterson, F. C. The solution structure of ZNF593 from Homo sapiens reveals a zinc finger in a predominantly unstructured protein. Prot. Sci. 17, 571-576 (2008). Gruswitz, F., O'Connell, J. & Stroud, R. M. Inhibitory complex of the transmembrane ammonia channel, AmtB, and the cytosolic regulatory protein, GlnK, at 1.96 A. Proc. Natl. Acad. Sci. USA 104, 42-47 (2007). Dyson, H. J. & Wright, P. E. Intrinsically unstructured protein and their functions. Nat. Rev. Mol. Cell Biol. 6, 197-208 (2005).